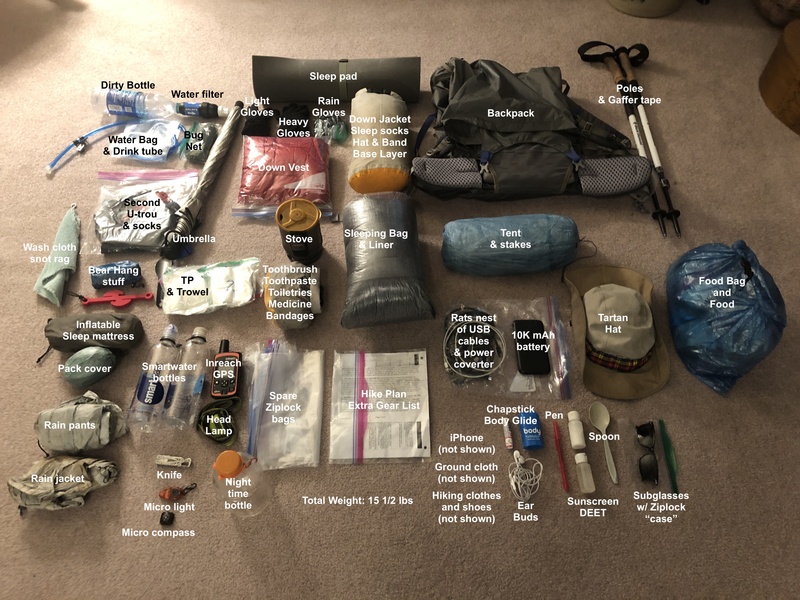 Here is my “kit” of gear. The “big three” (most weight) are my tent, sleeping bag and backpack. Overall everthing weighs without consumables (food and water) about 15 1/2 lbs, which is quite good. At the start I’ll be carrying four days of food, which is way too much for the first 60 miles, but I’m being conservative. Also I probably won’t eat that much, because hiker hunger will not have set in yet. From left to right, day 1, day 2, day 3 and day 4; from bottom to top breakfast, snack, lunch, snack and dinner. Don’t forget the awesome pillow case you made (which I am so impressed about). I now get emails every time you post, this is awesome! Safe travels. Thanks, I got it inside of the stuff sack labeled “Down jacket…” and just checked to make sure it’s there. That whole stuff sack is soft and is my pillow. Have a wonderful walk Tartan. I wish I had your organizational abilities, would make my own longer walks so much easier!!! Living vicariously through your hike, Tartan! I don’t think having my idiosyncrasies is anything anyone should be saddled with – ha! Remember your ergonomic instructions on using the walking sticks. No carpal tunnel this time. Take care! Good luck! We hope to see you when passing thru! I even bought new angled handled poles to help reduce it. Thanks!